air conditioning, 120 m2, high standard, 3 bedrooms, 2 bathrooms. Treat yourself to an exceptional stay in a luxury apartment in the heart of Cannes! Up to 8 people, this apartment of 120 sqm offers an ideal location for shopping or visit the Festival Palace located just a few steps. Possibility of 1 parking guarded basement close to the apartment. Located just steps from the Palais des Festivals and the beaches, the area is ideal to go shopping, eat or have a drink facing the sea. 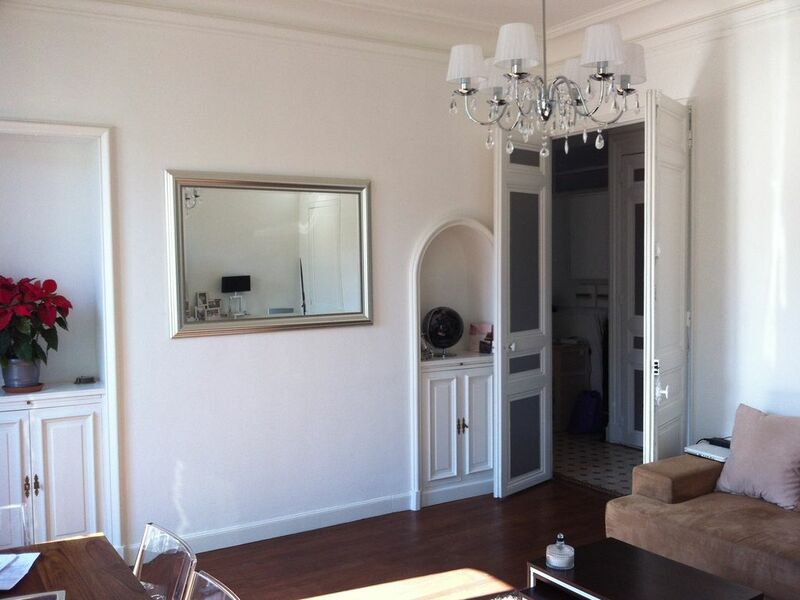 Its central location allows you to easily walk in all neighborhoods of Cannes. 2 bathrooms: 1 with bath 1 other with shower, and toilet. Option: Possibility 1 parking underground guarded close to the apartment 100 meters. 35 euros per week. Der Apartment war genau so wie auf den Bildern ist ein schönes Apartment . A. Maslach se rend disponible pour les questions. parking du Carrefour Market très pratique. War alles bei Hand, super Lage, nette Vermieter! Nachteil: Koffer/Einkäufe muss man immer zum 3. Stock hochschleppen! L'appartement est très bien aménagé, lumineux, meubles et literie très confortable. Belle décoration très chic. Si nous revenons à cannes ce sera dans cet appartement. The apartment is easily accessible by road, by plane (Nice airport 24 km) or by train (station 300 meters). The shops, bars and restaurants are all within walking distance, and the beach is only 70 meters. An ideal apartment for families enjoying the afternoon lazing by the water.